Bob the Tiny Titan opened his/her inflorescence at the Majorie McNeely (aka Como) Conservatory in St. Paul over April 9-10. Thousands visited and were astounded. Many also dipped into the visceral depths of olfactory challenge presented by Bob. I made a trip to Como on Thursday afternoon (April 10), as did Philip (who was also there on April 9). It was a great experience – Margaret was there to discuss Bob with the crowd, and Philip and I soon became additional impromptu expositors of the intricacies of the provenance, biology, general intellectual appeal, and aesthetic appeal of Bob. 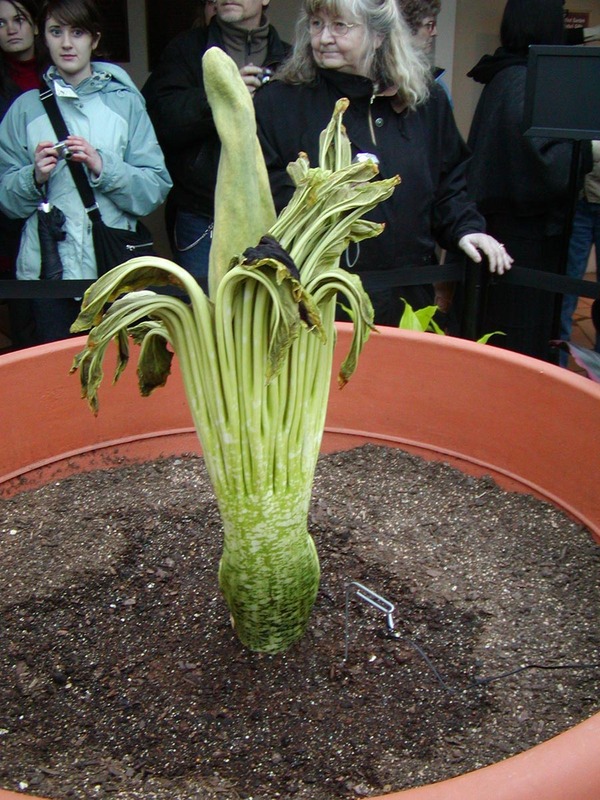 I really had not expected, after last year’s experience with Perry, to be doing exactly the same thing with another Corpse Flower a little less than a year later. On the other hand, I happily accept the experience :=). As mentioned in an earlier post, Bob’s inflorescence was produced from an unusually small corm (25 pounds – think of it as a 25-pound Gladiolus corm, for an unreasonable analogy…), so we were all surprised to see that the shoot was an inflorescence. But…everything went spectacularly well. News coverage of the flowering was extensive, and vast numbers of visitors appeared, despite the truly atrocious “spring” weather that was produced by the area of North America currently known as Minnesota. 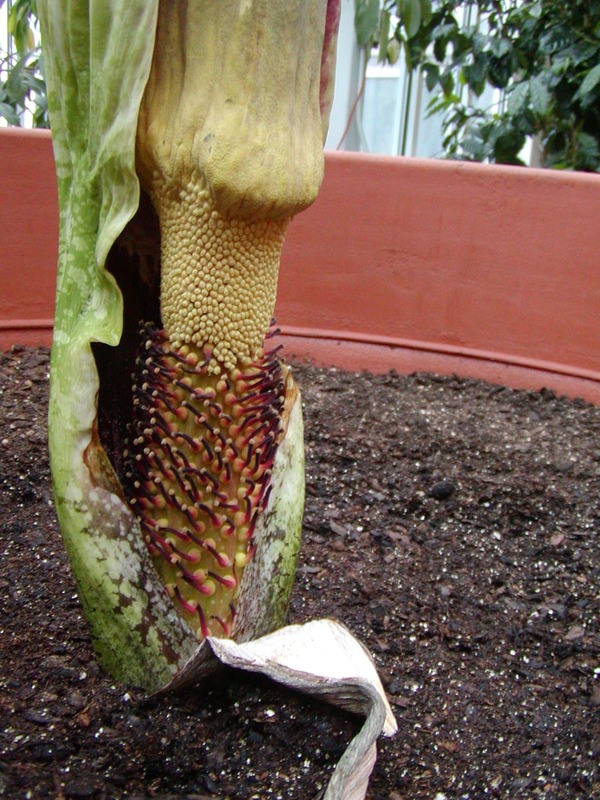 In addition to being unusually small, the spathe of Bob’s inflorescence did not open fully (though the color did develop normally), and the spathe did not fully surround the flowers. It’s possible that this was caused by some sort of trauma (mechanical, insect, etc.) to the shoot during dormancy. On the other hand, Bob’s inflorescence had a powerful presence in the room that simply cannot be reproduced by looking at photographs. 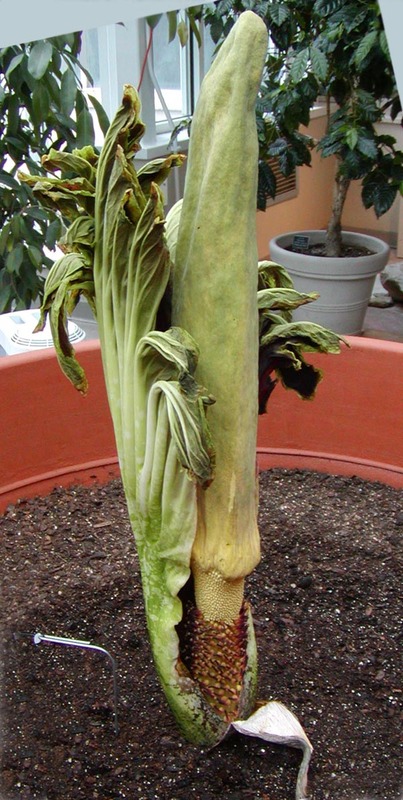 I advise those readers of this blog who have not yet had a chance to personally view Amorphophallus titanum in flower to make that a lifetime goal. An educational aspect of the male and female flowers being partly in view was that our descriptions of the pollination mechanism for the visitors were made much more straightforward, since we could point directly at all of the individual parts of the inflorescence during each presentation. In the photos below, the male flowers constitute the yellow band near the base of the spadix, and the clove-shaped protuberances below the male flowers are the female flowers. Margaret will be collecting pollen from Bob, and the pollen will be stored at Gustavus in a -80 C freezer in the Biology Department. The intent is to share the pollen with other institutions that might want to produce seeds on one of their Amorphophallus titanum plants. We could have pollinated Bob with pollen from Perry (collected last May), but the stress of producing seeds sometimes causes the plant to die (see this video for an analogy from film – skip to 8:00 in the clip, then begin; it’s a bit of a stretch, but is is the analogy that first occurred to me, and it does involve the death of a titanic entity); seed production would be especially hazardous for a small plant like Bob. Pollination might be attempted after Bob goes through a few more leaf cycles and reaches full size (the corm can easily approach 200 pounds in weight). Philip and I plan, however, to use some of the pollen from Bob and Perry to try to make some hybrids with other Amorphophallus species. It will be interesting to see which genetic traits prove to be dominant. Click on the thumbnails below for photos of the inflorescence and some of the humans associated with the event (note: these photos were taken on Day 2 of flowering, so Bob has started to wilt). 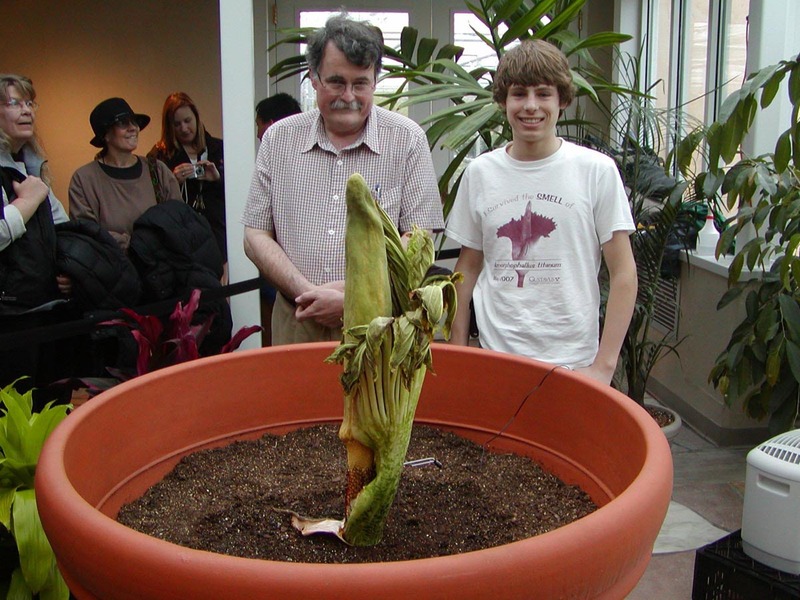 Note also the Gustavus Amorphophallus titanum T-shirt from last year’s Perry event, worn by one of said humans. One final note: we have a rather large specimen of Amorphophallus konjac (aka A. rivieri) coming into flower at Gustavus. It will open very soon and smell very bad. We plan to aim the Perry webcam at it while the A. konjac is in flower. Check the webcam frequently during the next 2-3 days. I plan to write a blog post on the plant soon. Click here for the Como Conservatory Bob Blog, written by Margaret.